We’re just about half way through Yam Yam! Festival, our six week festival of all things arts and foods, which has seen donkeys, goats and ferrets take over our garden, our cafe transformed into a delicious Phillippines pop up restaurant, a tour of discovery around Deptford’s West African shops and supermarkets, and loads more besides. This Friday and Saturday, Only Wolves and Lions will invite audience members to participate in the creation of a meal as part of a performance. Head of Creative Programmes Raidene Carter reflects on the relationship between food and performance. This blog originally appeared on the Exeunt website. At the moment, one thing is certain: food is cool. Hipsters instagramming their cronuts, the queues round the block at the latest “no bookings” pop-up, and high concept tasting menus with endless courses; there’s something of a foodie revolution happening. In the midst of this abundance of delicious new foodstuffs to sample, it’s easy to lose sight of the importance of not only what we eat, but how we eat. Food is sustenance. But it is much more than that too. Yam Yam!, the Albany’s festival of arts and food, part of an 18 month programme of food related activity supported by The Big Lottery Food Fund, is, in many ways, a reflection on this. We have performances that celebrate the rituals of dining, shows reflecting on the history and cultural significance of what we eat, and events that revel in the fun of sharing food. Unfinished Business’s Only Wolves and Lions (1st & 2nd November) is a great example. Each member of the small audience of 25 is asked to bring an ingredient with them and then, as part of the show, they work with their fellow audience members to cook up a delicious feast which they’ll share. The piece explores themes of community and isolation. By asking us to collaborate on the creation of a meal, artist Leo Kay creates a temporary community, with each audience member having to take a role, negotiating and making compromises for the good of the group. Friendships are formed, sometimes arguments erupt and finally we all share in the fruits of what we’ve created together. The show proves, perhaps far better than a conventional drama might, the true value of being part of a community. Because the experience is framed as theatre, we look at what is, ultimately, an everyday act, in a different way and perhaps carry some of that new perspective back to our own kitchens and tables. Kay isn’t the only artist exploring the experience of sharing food in theatre at the moment. At the Bristol Old Vic, The Table of Delights has recently been staged: a collaboration between a restaurant and Theatre Damafino. Yumm-A-Yukka-Boo is currently touring, introducing young audiences to the foods from different cultures. Perhaps this is symptomatic of the way we eat now. The abundance of food available to us, the speed with which we consume it, and the fact this is so at odds with what we know to be the experience of the vast majority of people alive today is demanding that we reconsider not only what we eat, but how we eat. It’s clear that performance practices – which have so much to do with the actions that define who we are – have a pivotal role to play in addressing this. This idea of the performative role that the rituals of preparing and sharing food have to play in making communities runs through the festival. At the Albany we are surrounded by an incredibly diverse array of cultures and heritages. The influence of food in cultivating integration is clear on Deptford High Street, where fishmongers and butchers mingle with Vietnamese cafes, Nigerian bakeries and Chinese supermarkets. Yam Yam! reflects this. Mazi Mas, for example, is a roaming restaurant that “showcases the culinary talents and diverse cultural heritages of migrant women in London”. During Yam Yam! they are hosting a series of three pop-up restaurants, focusing respectively on food from the Phillippines (17th October), Ethiopia (31st October) and South America (14th November). The experience for diners moves beyond simply consume the food; they will also find out more about how it is prepared and the rituals surrounding its consumption. 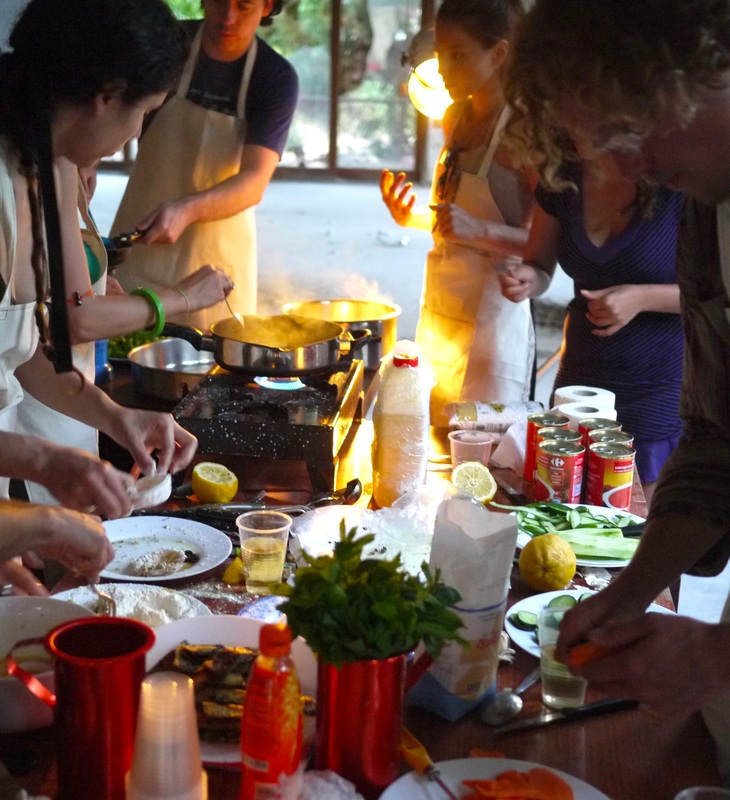 The act of cooking becomes a means of empowerment for women who are often long-term unemployed and socially marginalised, and by sharing the food, diners and chefs alike come to a deeper understanding of one another’s cultures and experiences. While events like this are less obviously “performance” or “art” in the conventional sense, we believe that by contextualising them in an arts space, we are inviting audiences to reflect on them differently, asking them to consider what and how they eat from a fresh point of view. David Slater, Director of Entelechy Arts, is one of the team behind Meet Me at the Albany, our artist led day club for the over 60s. Here he shares his reflections on his experience of the project so far. This was originally posted on his own blog, Creative, Arts and Older People. You can find out more about Meet Me at the Albany here. It’s only week four and it feels like it has been going on forever; this gentle hum of strangers turning into acquaintances; civic space being re-colonised by its oldest citizens. A café in a local arts venue with a piano dragged out into the centre of the room. There are people straining to read the words above the keyboard but it’s not necessary for this ancient script. It’s what we humans do, gossip, tell stories, sing, conjure objects out of whatever is to hand: paint, weave, sculpt and, here in London, drink tea. Meet Me at the Albany is the love child of two companies (Entelechy Arts and the Albany) coming together, seduced by the simple question: what if you were old, lived home alone, were getting depressed and lonely, what if you could go to an arts centre instead of a day centre? What if this was an ordinary and natural way of being able to connect with, and contribute to, things going on just around the corner, or a short ride away from where you live? Imagination, as the Brazilians say, at the service of the people. In the doing we are suggesting an intersection of need and idea; stitching the language of the natural, creative and spontaneous into the formal weft and warp of adult care provision, hospital discharge teams, occupational therapists. It’s going to take courage not to blink, to hold onto the possibility of the un-prescribed, the open form: belonging to everyone, belonging to no-one. Last week, Jeremy Hunt the government Health Secretary spoke of the forgotten million: the old and chronically lonely. Back in the Albany café, around the piano, the improvised Aretha Franklin moment is rising to a crescendo. Everyone is singing: “You make me feel…”, here now, not so lonely and maybe, deep down, feeling not so old. Perhaps, Minister, this is one small way for us to remember each other. Watch this space. It has been a big week in the theatre world. Last Tuesday, the new Artistic Director of the National Theatre was announced – the biggest job in our industry. It felt like a football transfer window, the new Doctor Who, and Christmas morning rolled into one, and it ended months of speculation about which of the top contenders – including the likes of Kenneth Brannagh, the Young Vic’s David Lan and Hampstead Theatre’s Edward Hall – would take the top spot. Finally it was announced that the job will go to Rufus Norris, a popular choice amongst the theatre industry, who generally hold the acclaimed director of Festen, Cabaret and London Road in high regard. The new appointment provides a good opportunity to reflect on the role of the National Theatre in the UK’s theatre landscape. There will inevitably be a huge amount of focus on the shows Rufus Norris chooses to programme; the playwrights he commissions and the celebrities he’s spotted dining with. But for me there is a more important concern for Rufus Norris’s incumbency. Ten years ago, I was brought to the Albany as part of a programme led by the NT that invested in the Albany and worked with young people in Deptford and Lewisham, aiming to reinvigorate the Albany’s role as a catalyst for the development of local communities and the area’s regeneration, and discovering what the role of a venue like the Albany could look like in the 21st century. The enterprise was part of The Art of Regeneration, a three year project driven by the late Jennie Harris – NT Education Director and the Albany Director in the 80s. The project wasn’t without controversy and its success compromised in some ways, but it would be fair to say that the Albany wouldn’t still be here if the project hadn’t existed. When it began, the fate of the Albany looked pretty grim: the building was falling apart at the seams with a skeleton staff of about five, a café open just a few hours a day, and a beautiful 300 seater theatre – that was permanently closed to the public. The National Theatre was able to bring the infrastructure and expertise that reinforced the crucial role the Albany could, and has, played at the heart of the Deptford ecology. Although we’ve had our ups and downs in the intervening decade, the project truly set the course for the Albany to become what it is today: a thriving creative hub with over 300 arts events and over 130k visitors each year. The Art of Regeneration ran from 2001–4, covering the last change over at the National; Sir Trevor Nunn, when he left in 2003, described the project as one of the things he was most proud of in his time at the helm. It was a fairly unusual project for the NT, but it needn’t be. It proved what a national organisation can achieve by working in partnership with specific communities. The current economic and political climate is forcing arts venues across the country to radically reappraise the roles they play in their localities. It strikes me that one of the challenges for Rufus Norris, as he seeks to define his own model for how the National Theatre must operate in today’s conditions, will be answering the question of the way in which the National Theatre can act as a leader, and supporter, of venues nationally. Ultimately the true test of his success will not only be the number of bums on seats on the Southbank, rather it will be the health of the performing arts landscape across the UK. The Albany is a different kind of arts organisation. Like many arts venues, we have a cracking programme of live events to sink your teeth into: from the best spoken word artists appearing at regular nights, a diverse theatre programme of work from some of Britain’s best theatre companies, regular events for families and kids, music, comedy and club nights – the building is never quiet for very long! But that’s only a small part of what we do. We are truly, and quite radically, driven by the idea of being a community arts centre, and that means so many of the activities that go on within the walls of the Albany, at our sister venues Canada Water Culture Space and Deptford Lounge, and indeed out and about in Deptford and further afield, are rather more ‘below the radar’. But we think they are an extremely important part of who we are and what we do, and we think it’s vital that they make up a part of the picture of what the Albany is all about. Many won’t know, for example, about the rich array of resident companies that we have within the Albany building- like performance poetry maestros Apples and Snakes, Heart ‘n’ Soul, an arts organisation with learning disability culture at its heart, and the Independent Theatre Council. Or that we have a (semi) regular market stall in Deptford Market, the incredibly bustling, diverse market that pops up on our doorstep every Wednesday, Friday and Saturday (where shoes are ‘three pound each; two for a fiver’). Or that we have chickens in residence in our beautiful garden (OK, we’re pretty obsessive about telling people about those already…). The blog will play a part in building this richer picture of what we do. We’ll peek behind the scenes, and chat to actors, artists and other company members about what they’re working on. We’ll share videos and photographs of what we’re getting up to. 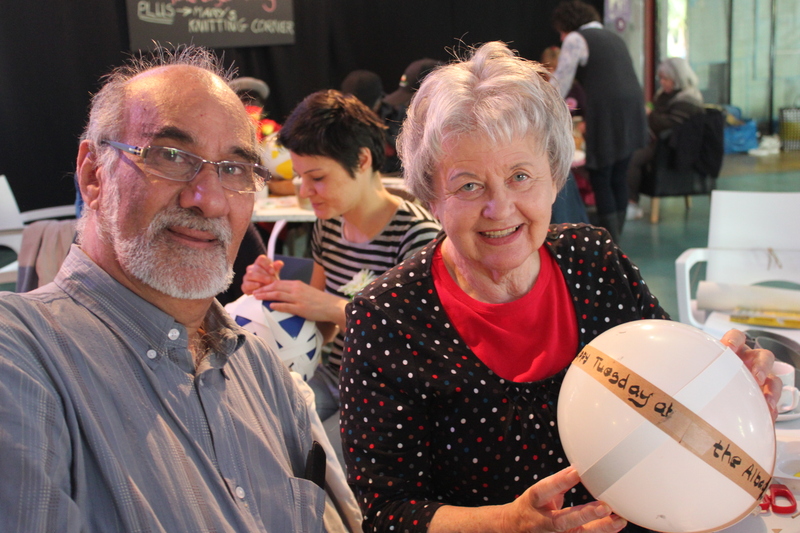 Most importantly we’ll give a voice to the people that engage with our work – like the participant in Meet me at the Albany, our day club for over 60s, who wrote a wonderful poem about her experiences here, or our Uncover Youth Theatre’s hilarious video spoofs of cookery shows. We also plan to use the blog to share some of the expertise and experiences of those working in the Albany building, and to comment on wider issues relevant to the arts and to the local community. Most importantly, though, we want our blog to be a forum for discussion, to help us learn more about our audiences and communities. Please do leave your comments and questions, and let us know what the Albany means to you. And remember you can tweet us or connect with us on Facebook.